Purchase it at this Amazon sales page with one-click HERE. We have entered a new era of razor’s-edged danger, rife with prophetic significance that world-renowned prophecy scholar, futurist and Nostradamus expert John Hogue can decipher and explain. A rush to open confrontation, heedless of any actual investigation into who gassed who in Syria, is exacerbated by Trump’s unprecedented game of matching aggressive bluff for bluff with the potentially unstable North Korean dictator, Kim Jong-Un, who may possess the capability to fire Intercontinental Ballistic Missiles tipped with nuclear weapons at the United States. The purported Syrian air force chemical attack on Khan Sheikhoun in Syria’s Idlib province might be false-flagged atrocities committed by al-Nusra Syrian rebels affiliated with al-Qaeda. It could be a ruse to trick President Trump and the American military into waging yet another bloody and disastrous regime-changing war in the Middle East, taking down what is left of the secular state of Syria—and that only strengthens the hand of terrorists, like ISIS, the Islamic State. 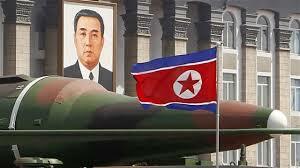 A number of prophecies of Nostradamus, the great sixteenth-century prophet, and other seers warn that a precipitous escalation against Syria, and a sudden, full-scale war in the Korean Peninsula, might quickly bring on a nuclear war between the United States against the Chinese and the Russians. Nostradamus, clearly gave short and long countdowns to World War Three. One starts counting when a second cold war has started. That happened with the Ukrainian Civil War and a salvo of US sanctions and Russian counter-sanctions in late April 2014. The short countdown is upon us. A worsening military crisis with Syria and North Korea could unleash a US-Russian nuclear exchange any time from now up through November 2017! This book will take you into an alternative universe of facts over hearsay, skeptical inquiry over impulsive, uninformed and potentially history changing, and history “ending” international moves. 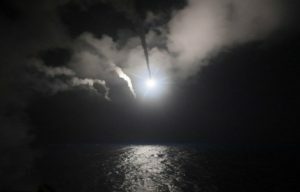 In his strike on Syria with 59 Tomahawk missiles, President Trump made an about-face, a 180-degree swing away from his often-delivered campaign promises, such as staying out of the ruinous military game of regime change and resolving US disputes with Russia. A new cold war was foreseen getting suddenly and unexpectedly “hot.” Nostradamus gives two countdowns. The war erupts in late 2017 or 2027. Click on the cover and read how this future can be changed. It could very well be that this complete axis shift in Trump’s foreign policy views followed by bellicose and hasty military actions denote a subtle coup d’état in motion. It consists of a possible co-opting of a gullible and politically inexperienced president by the political denizens of the Washington’s swamp of corruption and special interests he promised as president to drain. 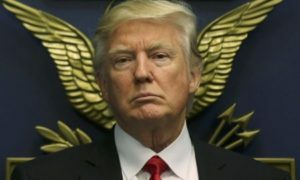 Trump may have been the casualty of a putsch, of which he is unaware, committed by his military and intelligence handlers belonging to a corporately financed and strengthening National Security State who are under the illusion that they can control and even win a Third World War. This book will investigate solid evidence beyond appearances and mainstream media manipulation to disclose just how potentially (and intentionally) uninformed Trump’s decision may have been to strike Syria, and—perhaps any moment from now, attack North Korea—with earthshaking consequences for us all. This future need not happen, and John Hogue will consult Nostradamus and other significant seers down through history that present for us alternative, positive choices we can make as we stand at this potent and potentially apocalyptic crossroad in time. 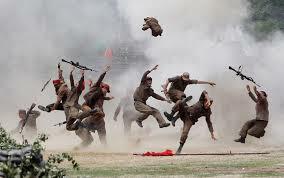 South Korean soldiers hamming it up in mock battle, costumed in North Korean uniforms. 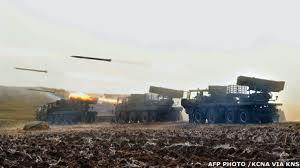 Will there be an Israeli-Syrian War? First Strike Syria, Next Strike Iran? The Loose Cannons of War? !HOGUE ON COAST TO COAST AM! Join me and host George Noory at 10pm to midnight (Pacific) next Wednesday 10 May 2017. 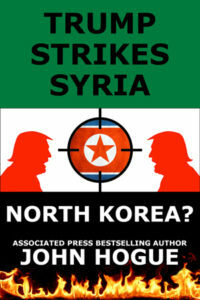 We’ll be talking about my newest book, Trump Strikes Syria: North Korea? Plus catch you up on many exciting and history changing things happening in prophecy’s take on rapidly changing current world events.